There’s one thing that makes the Lyonnaise prouder of their wonderful city than anything else and that’s their food.There is a saying there, that Lyon has the finest larder in all of France.There are a whole host of world famous chefs who are based in Lyon including possibly the most famous of them all – Paul Bocuse.Of course, although you can eat well in Lyon at any time of the year. The best time is to visit in the colder months and enjoy the hearty specialities in the friendly ‘bouchons’ which are Lyon’s version of the bistro. It’s actually quite easy to get to Lyon from the UK, the Eurostar runs a service from St Pancras which takes only 5 hours and arrives at 1pm on the same day.You can go direct of via daily trains from Paris or Lille. It’s a fairly straight forward journey but do expect some increased security checks to take place. The best airline to travel to Lyon cheaply from the UK is probably Easyjet. Although British Airways also fly direct to Lyon from several different UK airports. Many of the other airlines have started to fly to Lyon, most recently FlyBe from Heathrow. When you’re in France you can check the UK prices for flights by using a VPN like this one here. The main airport is somewhat outside the centre, approximately 25 km to the East.The best and cheapest way to get into the city is using the Rhone Express tramway which only takes about 15 minutes. The trams also run very frequently, in daytime hours every 15 minutes or so and then every half an hour up until midnight.You can get a return for about 27 Euros at time of writing which is much cheaper than using taxis. The Part-Dieu station is in the centre of a modern business sector of Lyon, with a world famous sky scraper the Tour Part Dieu.It’s easy to get around Lyon, just by using the underground and the inexpensive local bus service. The Presqu’le has some wonderful 19th and 20th century architecture with classy shops, stylish cafs and superb restaurants lining its mostly pedestrianised north-south boulevards. The largest open space is the Place Bellecour (3), where you can also find the Tourist Office (00 33 4 72 77 69 69;open 9am to 6pm daily). From here you can also buy a Lyon City Card (32 for 48 hours) with unlimited public transport and free entry to museums. The northern part known as the Croix-Rousse, was once the home for a thriving market in silk weavers but is now a trendy area with a young feel. 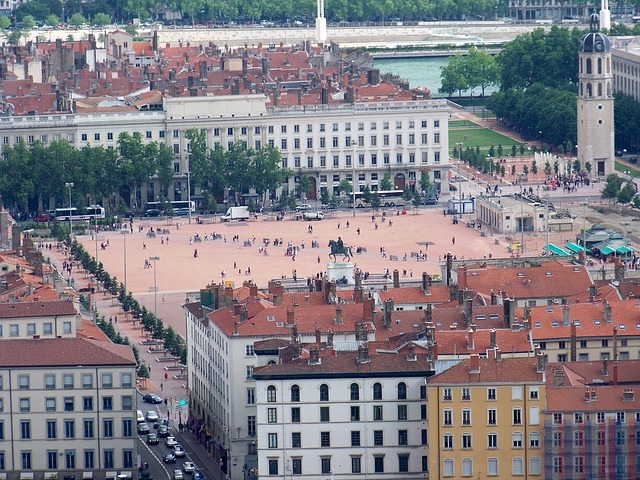 La Confluence, at the tip of the Presqu’le, is the largest current urban redevelopment in Europe, while Le Vieux Lyon, on the Sane’s west bank, is a Unesco-listed area notable for its concentration of magnificent Renaissance architecture.